Graeme S. Halford, William H. Wilson, and Steven Phillips (2010). Relational Knowledge: The Foundation of Higher Cognition, Trends in Cognitive Sciences 14(11) 497-505. doi:10.1016/j.tics.2010.08.005 ISSN: 1364-6613. Typographical correction here. Citations: Google Scholar: 100+. Steven Phillips and William H. Wilson (2010). Categorial compositionality: A category theory explanation for the systematicity of human cognition. PLoS Computational Biology. 6(7): e1000858. doi:10.1371/journal.pcbi.1000858 Link to article. eISSN 1553-7358, ISSN 1553-734X Citations: Google Scholar: 50+. Graeme S. Halford, Steven Phillips, William H. Wilson, J.E. McCredden, Glenda Andrews, Damian Birney, Rosemary Baker, John D. Bain, (2007). Relational processing is fundamental to the central executive and is limited to four variables Chapter 16, p. 261-280 in Naoyuki Osaka, Robert Logie & Mark D'Esposito (eds) The Cognitive Neuroscience of working memory: Behavioural and neural correlates, Oxford University Press. ISBN 978-0-19-857039-4. Kyongho Min and William H. Wilson, (2007). Effectiveness of Methods for Syntactic and Semantic Recognition of Numeral Strings: Tradeoffs between Number of Features and Length of Word N-grams, pp. 445-455 in Mehmet A. Orgun and John Thornton (eds.) AI 2007: Advances in Artificial Intelligence, Proceedings of the 20th Australian Joint Conference on Artificial Intelligence, Gold Coast, Australia, December 2007, Springer Lecture Notes in Computer Science 4830. ISBN 978-3-540-76926-5; ISSN 0302-9743. Spyridon Revithis, William H. Wilson, and Nadine Marcus (2006). IPSOM: A Self-Organizing Map Spatial Model of How Humans Complete Interlocking Puzzles. pp. 285-294 in AI 2006: Advances in Artificial Intelligence, Proceedings of the 19th Australian Joint Conference on Artificial Intelligence, Hobart, Australia, December 2006, edited by Abdul Sattar and Byeong-Ho Kang, Lecture Notes in Computer Science 4304/2006. ISBN 978-3-540-49787-5, ISSN 0302-9743. Kyongho Min and William H. Wilson (2006). Comparison of Numeral Strings Interpretation: Rule-based and Feature-based N-gram Methods. pp. 1226-1230 in AI 2006: Advances in Artificial Intelligence, Proceedings of the 19th Australian Joint Conference on Artificial Intelligence, Hobart, Australia, December 2006, edited by Abdul Sattar and Byeong-Ho Kang, Lecture Notes in Computer Science 4304/2006. ISBN 978-3-540-49787-5, ISSN 0302-9743. Kyongho Min, William H. Wilson, and Yoo-Jin Moon (2004). Various Factors Influencing Document Classification, pp. 50-59, in M.Mohammadian, (ed. ), CIMCA 2004 Proceedings, Gold Coast, Australia, 12-14 July 2004, ISBN 1-740-88188-5. Yuk W. Cheng, Deborah J. Street, and W.H. Wilson (2003). Two stage generalized simulated annealing for the construction of changeover designs, 69-79 in Designs 2002, ed. W.D. Wallis. Boston: Kluwer Academic Publishers, 2003. ISBN 1-4020-7599-5. Kyongho Min, William H. Wilson (2003). Effectiveness of Syntactic Information for Document Classification, pp. 992-1002, in T.D. Gedeon and L.C.C. Fung, (eds), Proceedings of the 16th Australian Conference of AI, Perth, Australia, December 2003, Lecture Notes on Artificial Intelligence 2903, Berlin: Springer, 2003. ISBN 3-540-20646-9. Kyongho Min, William H. Wilson, and Yoo-Jin Moon (2003). Korean Compound Noun Term Analysis Based on a Chart Parsing Technique pp. 186-195, in T.D. Gedeon and L.C.C. Fung, (eds), Proceedings of the 16th Australian Conference of AI, Perth, Australia, December 2003, Lecture Notes on Artificial Intelligence 2903, Berlin: Springer, 2003. ISBN 3-540-20646-9. Kyongho Min, William H. Wilson, and Yoo-Jin Moon (2002). Preferred Document Classification for a Highly Inflectional/Derivational Language, 12-23 in McKay, Bob and Slaney, John (eds), AI2002: Advances in Artificial Intelligence, 15th Australian Joint Conference on Artificial Intelligence, Canberra, Australia, December 2002. Lecture Notes in Artificial Intelligence 2557, Springer, 2002. ISBN 3-540-00197-2. W.H. Wilson, G.S. Halford, B. Gray, and S.A. Phillips, (2001). The STAR-2 Model for Mapping Hierarchically Structured Analogs, pp. 125-159 in Gentner, D., Holyoak, K. J., & Kokinov, B. N. (Eds.) The analogical mind: Perspectives from cognitive science. Cambridge, MA: MIT Press, 2001. ISBN 0-262-57139-0 PDF Citations: Google Scholar: 50+. W.H. Wilson, & G.S. Halford (1998). Robustness of tensor product networks using distributed representations, Proceedings of the Ninth Australian Conference on Neural Networks, Brisbane, Australia, 11-13 February 1998, edited by Tom Downs, Marcus Frean, and Marcus Gallagher. pp. 47-51. ISBN 1-86499-026-0. ACNN98. PDF - about 29KB. This is a different paper from the 1994 paper of the same name. G.S. Halford, W.H. Wilson and S. Phillips (1998). Processing capacity defined by relational complexity: Implications for comparative, developmental and cognitive psychology, Behavioral and Brain Sciences vol. 21(6) (1998) 803-831. ISSN 0140-525X. PDF version (376K). Google Scholar Citations: 1000+. G.S. Halford, W.H. Wilson and S. Phillips (1998). Authors' response: Relational complexity metric is effective when assessments are based on actual cognitive processes, Behavioral and Brain Sciences vol. 21(6) (1998) 848-864. ISSN 0140-525X. PDF (180K). Kyongho Min and William H. Wilson (1998). Syntactic recovery and spelling correction of ill-formed sentences, pp. 293-306 in Perspectives on Cognitive Science: Theories, Experiments, and Foundations, vol. 2, edited by Janet Wiles and Terry Dartnall, Stanford, Connecticut: Ablex Publishing Corporation, 1999. ISBN 1-56750-382-9 and 1-56750-383-7. Adnan Amin, Sankaran Iyer, William H. Wilson (1997). Recognition of hand-printed Latin characters based on a structural approach with a neural network classifier, Journal of Electronic Imaging 6(3) 1997, 303-310. ISSN 1017-9909. T.D. Gedeon, G.A. Mann, W.H. Wilson, and R.A. Bustos (1996). Separation of Basic Competency Acquisition from Deep Learning in Teaching and Assessment in an undergraduate Computing subject, Australasian Conference on Computer Science Education, Sydney, 1996. 287-294. G.S. Halford, W.H. Wilson, and S. Phillips (1996). Human analogical reasoning capacity: Towards a neural net model, International Journal of Psychology, 31(3/4) 1996, 443 ISSN 0020-7594. Steven Phillips, Graeme S. Halford, and William H. Wilson (1995). The processing of associations versus the processing of relations and symbols: a systematic comparison, 3rd Conference of the Australasian Cognitive Science Society (CogSci'95), Brisbane, April 1995, 96. Kyongho Min and William H. Wilson (1995). Hierarchical Multiple Error Recovery based on Chart Parsing, Proceedings of the Third Natural Language Processing Pacific Rim Symposium (NLPRS95), Edited by Key-Sun Choi, Seoul, Korea, 4-6 December, 1995, 314-319. Gedeon TD, Wilson, WH, Mann, GA and Bustos, RA (1995). Assessment of Basic Competency Acquisition versus Deep Learning in an undergraduate Computing subject, in Hewson, L and Toohey, S The Changing University, Proceedings UNSW Education '95 Conference, pp. 171-183, Sydney, 1995. Graeme S. Halford, William H. Wilson, Jian Guo, Ross W. Gayler, Janet Wiles, and J.E.M. Stewart (1994). Connectionist implications for processing capacity limitations in analogies, pages 363-415 in K.J. Holyoak and J. Barnden (editors) Advances in Connectionist and Neural Computation Theory: Volume 2: Analogical Connections, Norwood, NJ: Ablex, 1994. Reprint (HTML format - about 550K including figures). This chapter has 200+ Google Scholar citations. William H. Wilson and Graeme S. Halford (1994). Robustness of tensor product networks using distributed representations, p. 258-261 in Proceedings of the Fifth Australian Conference on Neural Networks, ACNN'94, edited by A.C. Tsoi & T. Downs. 31 January-2 February 1994. Brisbane: University of Queensland. (PDF - about 730K). This is a different paper from the 1998 paper of the same name. Janet Wiles, Graeme S. Halford, Julie E.M. Stewart, Michael S. Humphreys, John D. Bain, and William H. Wilson (1994). Tensor Models: a creative basis for memory retrieval and analogical mapping, pages 147-161 in Artificial Intelligence and Creativity: an Interdisciplinary Approach, edited by T. Dartnall, Kluwer, 1994 . Kyongho Min and William H. Wilson (1994). Chart parser for ill-formed input sentences, Language Teaching and Research, XXIII (August 1994), Language Research Centre, Chonnam National University, 141-154. Graeme S. Halford, Janet Wiles, Michael S. Humphreys, and William H. Wilson (1993). Parallel distributed processing approaches to creative reasoning: Tensor models of memory and analogy, pp. 57-60 in AI and Creativity ed.T. Dartnall, S. Kim, R. Levinson and D. Subramanian, Artificial Intelligence and Creativity, Papers from the 1993 Spring Symposium, Technical Report SS-93-01. Menlo Park, CA: AAAI Press, 1993. PDF ISBN 0-92980-38-5. Adnan Amin and W.H. Wilson (1993). Hand-printed character recognition system using artificial neural networks, in Proceedings of the Second International Conference on Document Analysis and Recognition, Japan, October 1993, (Los Alamitos CA: IEEE Computer Society Press) 943- 946. William H. Wilson (1992). Dealing with unknown words: Classifying unknown letter-strings using trigram analysis, Australian Computer Science Communications 14 No. 1 (February 1992) 981-988. A. Rahardja, A. Sowmya, and W.H. Wilson (1991). Component versus holistic approach to facial expression formation and recognition of facial expressions in images, Proceedings of the Conference on Neural Networks for Vision and Image Processing, Wang Institute, Boston University May 1991, 56-57. J. Wiles, G.S. Halford, J.E.M. Stewart, M.S. Humphreys, J.D. Bain, and W.H. Wilson (1991). Tensor Models: a creative basis for memory retrieval and analogical mapping, page 46-48 in AI, Reasoning, and Creativity, edited T. Dartnall, Brisbane: Griffith University, 1991. Deborah J. Street, J.A. Eccleston, and William H. Wilson (1990). Tables of small optimal repeated measurements designs, Australian Journal of Statistics 32(3) (1990) 345-359. Tao Li, Luyuan Fang, and William H. Wilson (1990). Parallel approximate solution of 0/1 knapsack optimization on competitive neural networks, pages 281-286 in Parallel Computing 89, edited by D.J. Evans, G.R. Joubert, and F.J. Peters, North-Holland, 1990. Luyuan Fang, William H. Wilson, and Tao Li (1990). A neural network for job sequencing, pages 253-256 in Parallel Processing in Neural Systems and Computers, edited by Rolf Eckmiler, Georg Hartmann, and Gert Hauske, Amsterdam: North-Holland, 1990. Tao Li, Luyuan Fang, and William H. Wilson (1989). Running rule-based expert systems on parallel processors, Knowledge Based Systems, 2 (1989) 27-36. Luyuan Fang, William H. Wilson, and Tao Li (1989). Experiments on sequence programming with neural networks, Proceedings of the Third Pan Pacific Computer Conference 1989 (Beijing), 164-170. Luyuan Fang and William H. Wilson (1989). A study of sequential pattern processing on neural networks, Proceedings of the International Joint Conference on Neural Networks 1989 (Washington, D.C.) (IJCNN-89), 599. Luyuan Fang, Tao Li, and William H. Wilson (1988). Storing semantic information in stochastic neural nets, Australian Computer Science Communications 10 No. 1 (February 1988), 68-77. Luyuan Fang and William H. Wilson (1998). Character recognition on a computational neural network, in Proceedings of the Australian Joint Conference on Artificial Intelligence 1988, 431-438. Also published in Lecture Notes in Artificial Intelligence (Subseries of Lecture Notes in Computer Science) 406, 424-431, Berlin: Springer-Verlag, 1990. Luyuan Fang, William H. Wilson, Tao Li, and Chris Barter (1998). A computational neural network for recognizing character patterns, Proceedings of the International Computer Science Conference 1988 (Hong Kong), 401-405. William H. Wilson, Context tracking for natural language processing (1987): Australian Computer Science Communications 9 No. 1 (February 1987) 418-428. Luyuan Fang, Tao Li, and William H. Wilson (1987). Implementing semantic networks in stochastic neural nets, Proceedings of the Australian Joint Conference on Artificial Intelligence 1987, 323-332. This paper is reprinted in Artificial Intelligence Developments and Applications, edited by J. Gero and R. Stanton, North Holland, 1988, pages 351-361. William H. Wilson, Christopher F. Burrows and Michael M. Sidhom (1982). Design of an interactive financial planning package, Australian Computer Journal 14 (1982) 26-31. Graeme S. Halford and William H. Wilson (1980). 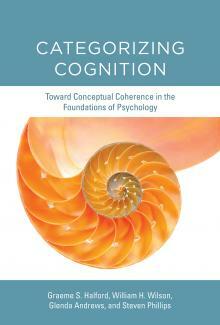 A category theory approach to cognitive development, Cognitive Psychology 12 (1980), 356-411. (PDF - about 135K) Keywords: structure mapping, cognitive development, cognitive system level. Here is the abstract. doi:10.1016/0010-0285(80)90014-6 This paper has 150+ Google Scholar citations. Elizabeth J. Morgan, Deborah J. Street and William H. Wilson (1977). Solution Manual to Combinatorial Theory: an Introduction, 68 pages, Winnipeg: Charles Babbage Research Centre, 1977. Graeme S. Halford, Steven Phillips and William H. Wilson (2008). The missing link: Dynamic, modifiable representations in working memory, Behavioral and Brain Sciences 31 (2), April 2008, pp 137-138. doi:10.1017/S0140525X080036304. ISSN: 0140-525X. EISSN: 1469-1825. Only reports that contain significant material not published elsewhere are listed. Jane Brennan, William Wilson (1999) "An approach to formalising relationships between speaker-relative and absolute spatial reference systems", Computer Science and Engineering Technical Report no. UNSW-CSE-TR-9908 (13 pages). William H. Wilson (1984) "Context and Linguistic Knowledge in Natural Language Processing", Technical Report 59, Department of Computer Science, University of Queensland (35 pages). PDF (580 Kb) Some of the content appeared in Wilson (1987).